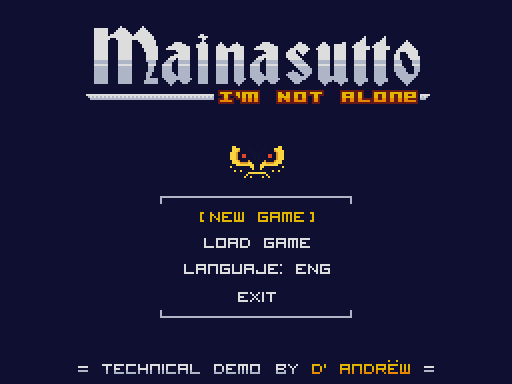 Re: Mainasutto: I'm not Alone || DEMO REALEASE DATE NOW! I feel like the background texture for the menu should animate or something. You also misspelled "release" in your topic title. I was thinking on add some animated movement to the background, like a vertical very slow movement. 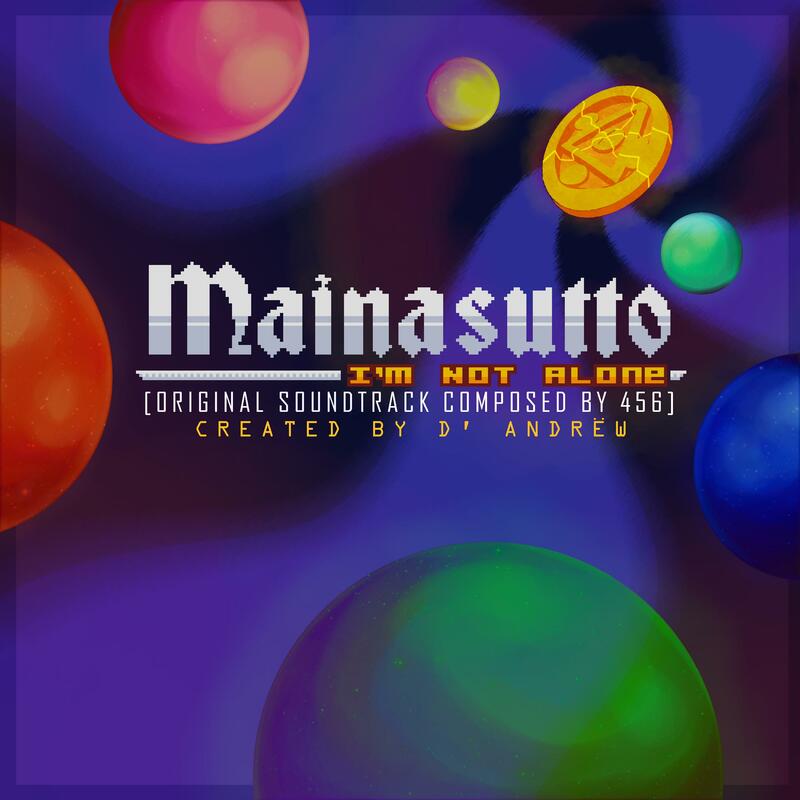 Re: Mainasutto: I'm not Alone || Updates every Saturday! 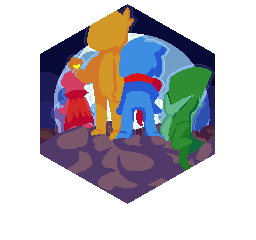 I actually want to work more on the game but I haven't a lot of motivation to continue it after a few things, anyway, I did some things that you probably want to know. Actually, I'm still working (and I think that I'll working at least 2 weeks more) in the Pause menu subsections. This week I finished the Options/config and the artifacts menu. 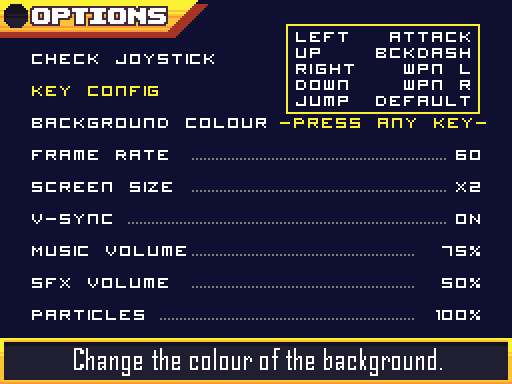 As you can see on the last post, I did a mockup of the Options Menu that includes a background colour option and a frame rate configuration, thing that this mockup have too, but on the final version I remove the frame rate 'cause run the game at 30fps besides 60fps made a lot of trouble with some alarms and codes (specially dialogs and doors transitions). As you can see, I also add a particles option with a % on it, this was added at first as a debug tool that makes the game compatible on this crappy laptop that I was working from last weeks of December and I'll be working almost to the end of February, but after watch the result of this in action, I make it an option to the Pause menu, making the game run on 60fps (without fps crashes) only with the 50% of the particles on a Intel Celeron with 2gb of RAM even on the save animation (which creates 144 particles per second with the 100% of this option). After this menu is done, I decided to start the work on the Artifacts Menu, these artifacts works, as well, as the relics system on Castlevania: Symphony of the Night, as key items that will follow the player on all his adventure, but he can deactivate, making the game harder, some artifacts would be necessary to get the true ending and other just will help showing enemy HP, run faster, double jumps, etc. 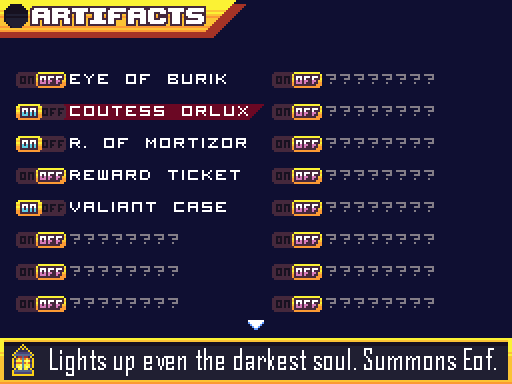 My first idea was made it like the inventory menu with an arrow below and make it as a big list with almost 30 different artifacts, but after a lot of troubles making it larger, I decided to make (at the moment) just 16 artifacts, BUT, a few of the could be selected by the player. 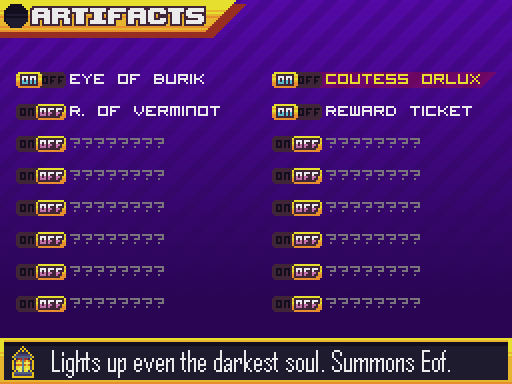 Maybe you're asking, How/what is this?, selected by the player?, well, as I said, you can only have 16 artifacts, but that doesn't mean that are only 16 artifacts on the game, some of this could be obtained by different ways, the best example is the "Ring of Moritzor" and "Ring of Verminot", if you see the mockup compared to the final version you'll see that they 2 use the same space (the 3rd space in the memory), but you can have only one of them two, and them have different effects on the game and can't be changed in the game. And... That's all for this week, I guess that I'll release finally the technical demo on first weeks of February. Great work on your progress! What a nice day for updates for god sake! 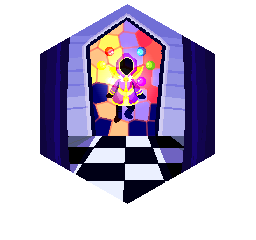 So, first of all, I implemented a Bloom Shader to the game in certain rooms (actually I want to use only on special moments or cutscenes of the game), I don't find the post from where I found the shader, but when I find it, I'll edit this post. Anyway, wasted almost 2 hours implementing the shader to my engine and make it work in a very small resolution (256x192), and after testing it with the actual most "powerful" animation in the game, the Save Game animation, whichs creates 144 particles every ~0.25sec, and this was the result with diverse quanty of particles activated on a very low specs PC (~2012 PC). Actually I want to add some new frames to walk and run animation. 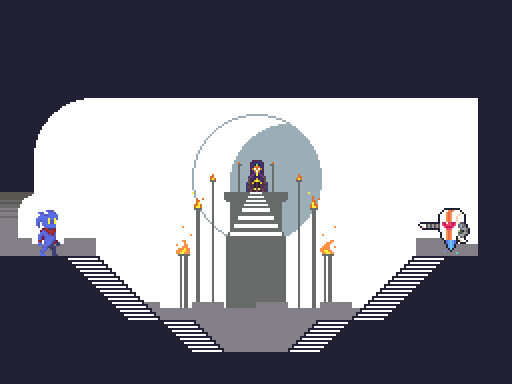 Also!, on my way to make the technical demo, I was doing some mockups of the rooms, and there are two of them, the main menu screen and maybe the boss fight room, I'll program it later. I did this today, but I was thinking on add some animations similar to the pause menu on this screen. 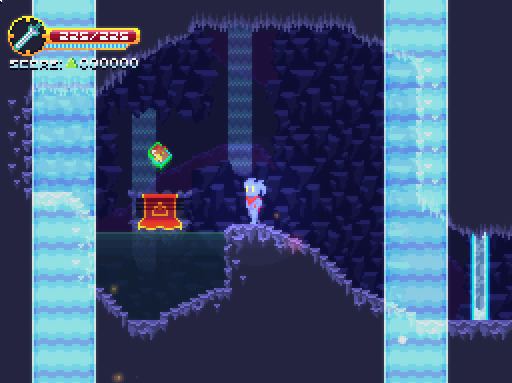 Also, after a lot of coding and having fun with the particle effects of the save point, I made a level up animation and totally implemented in it. here is how it actually works. // All valors clamped to a max of 999. 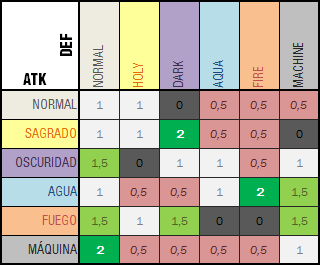 INT ironically actually makes the stamina grow on 5 by every 5 levels; and LCK regulate your drop chance and possibility of critical hits. Also, few hours ago I painted with the PaintChainer algorithm some old sketches and conceptual art to a physical case of the game. Aaaaand... That's all for this week. Oh I see. I may be able to help out with the epic orchestral tracks. 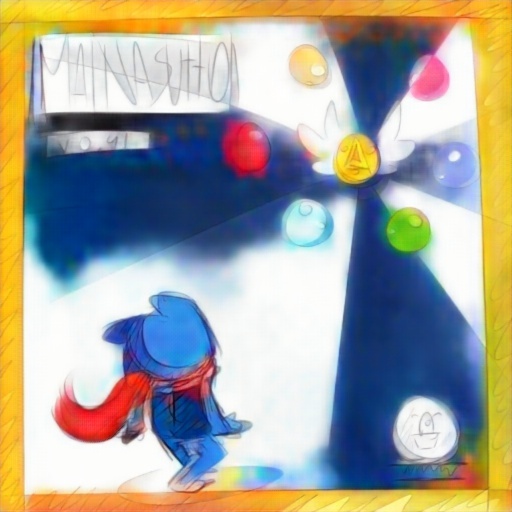 Here's a few of my demo songs which could work as a boss battle. 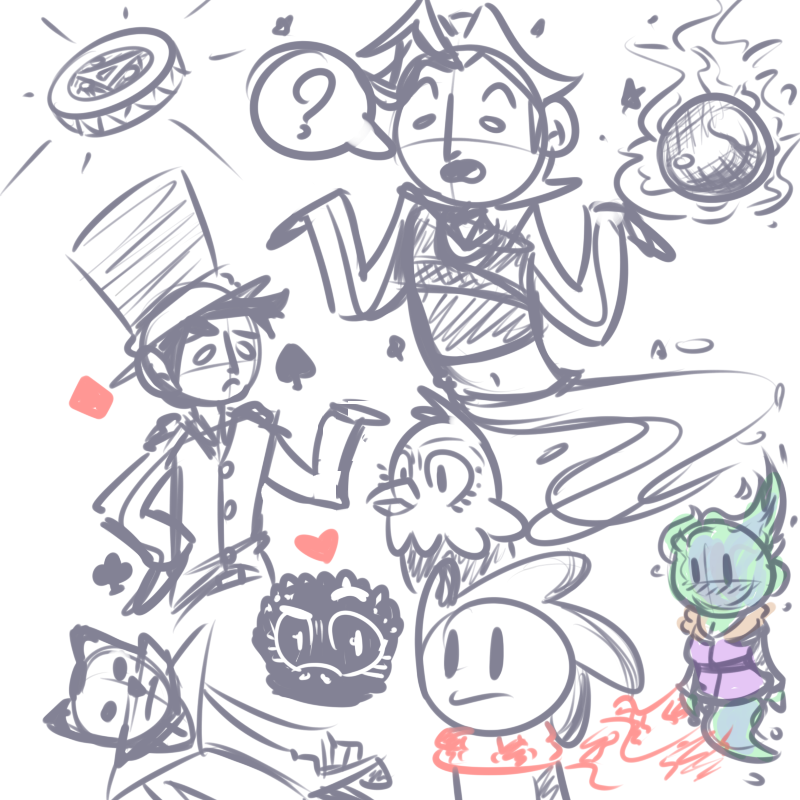 Last weekend I was so busy on my coming back to home, so I didn't post anythig about, but already, I ded just a few things in the game 'cause I haven't time to use my laptop in my grandma town's. Anyway, I'll show you the few updates, and ironically, including one of the most relevants in the game. 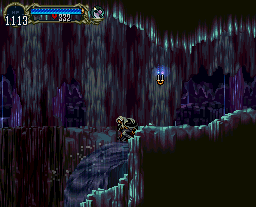 The first thing that I did this week was work with the backgrounds and some extras to the demo cavern, also, I did a better bloom shader based in the last one that I posted, also, the background pallete was based on the Underground Caverns of Castlevania Symphony of the Night as you can see. Also, I did a Time Stop skill based on Jojo Bizarre Adventure (DIO's Za Warudo), that the ones that already know about it, will complain a bit, 'cause this skill won't stop the time at all, just makes it a 95% slower, but the effect makes it feel like the time stop by the clock of CV:SotN. I don't have too much words to describet it, so I leave a video here. This was made adding a global variable called TIMESPD (time speed). It controls the image speed, the disappear/appear speed and the regular speed of almost everything on the game, except the player and some NPCs that known how to control the time for a few seconds. ALSO, this skill will be upgraded along the game, it'll start in 1 second of time freeze, and could be upgradeable in the best path to 9 seconds, spending a lot of stamina for every second. By the way, you need to do a combination of keys to activate it, maybe I will leave it on [up down up down left right left right backdash]. I was listening your portafolio and I'm very interested on commision a track in a near future. Isn't too late for posting?, 'cause this week has a lot of uptades to see! This week starts with some spriting and vfx update and ended with it, the first I did is an intro animation to the player, as a "player start animation", I put a "easter egg" detail which can be seen if observed in detail the animation. The animation, obviously looks better in game with the movement and the particle effects that it have. Next, I started to work in the menu screen and it was really easy to do, but I change a few details from the mockup version that you can see in the previous post. Also, I reduce the mouse sprite to 2x2px sprite in every resolution (it doesn't grow or shrink when you change the resolution). With the "Mystery eyes" sprites added, I use the same sprite to add a NPC which explains you about the universe of the game when the demo starts. Actually, the universe where this demo is in, isn't the final universe and this things won't affect in the final release. 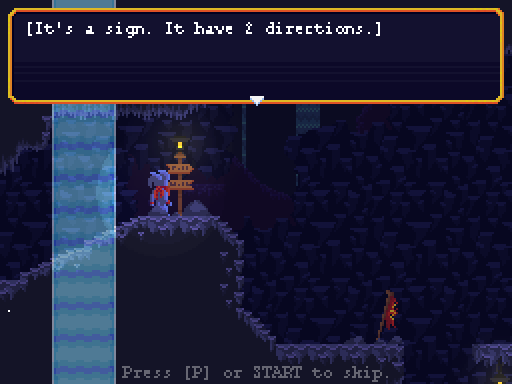 So, I started to work in the rooms to the demo, I did the room design in as a mockup, and then I added to the game, and with it added, I started to work in the signs sprites, and the textboxes to this signs. As you can see below, there are the 3 different sprites and how it looks in game. You can see also that the last screenshot haven't the bloom shader, that's 'cause this is how the game will look in the 'non-important' rooms, I'll use the bloom shader just in saverooms, transition rooms, and maybe bosses rooms. I also change the view system, making it more comfortable, in the sense that you actually can see more things on the direction that the player is watching, almost 48px more than before (the original system allows to see 128px to the left and right, now you can see 176px to the player direction and 80 to the other direction). Next step was something that I was thinking yesterday and I spend almost 6 hours on complete it. 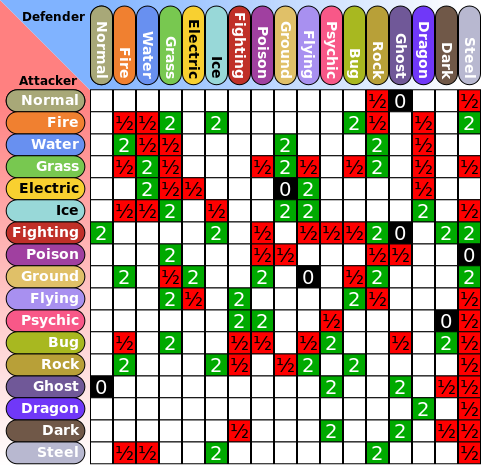 Maybe you actually know the Pokémon types charts. Actually, I realize that if I wanna make the game have more replay action and consistence in the universe logic, I will need to add types or kinds of damage, adding this to the boosts, and the weapons. Also, adding a type to every enemy and his own weakness and strenghts. 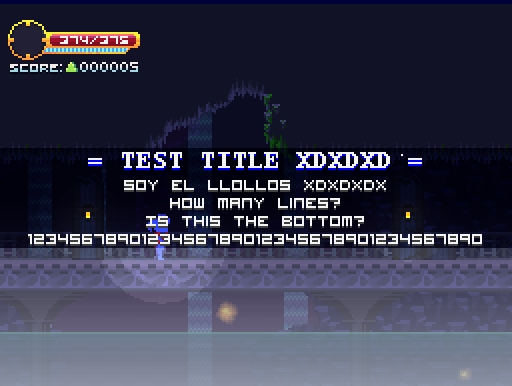 You can see the chart below, the damage dealer is in spanish at the left and the reciever type is in english on top. It was really hard to did it, and I need to added 3 more scripts, to calculate the normal damge multiplier, the total damage multiplier, and the final damage with the enemy defense in. With every type added to the weapons, I add some particle effects to the every kind of weapon, as you can see with the NORMAL and HOLY type hit animation. Finally, I added a simple IA of a bat kind enemy which is DARK type, so, as you can see in the video below, it recieved big different amounts of damage even if these 2 weapons have only 6pts difference in their ATK/STR. Oh, I and forget to mention it, I added some kind of locked doors, also can be watched in the video below. PS: I forget to upload this concepts that I make weeks ago. There are some NPCs of the game. Well, that's all from the last week, next week I'll release de tech demo. Re: Mainasutto: I'm not Alone || NEW DEMO RELEASED! I have a lot of news to say about the game, but I prefer that you discover them for yourselves. The demo is on the front page of the post, I also change the original post completely, so I'm gonna put the old Original post below. 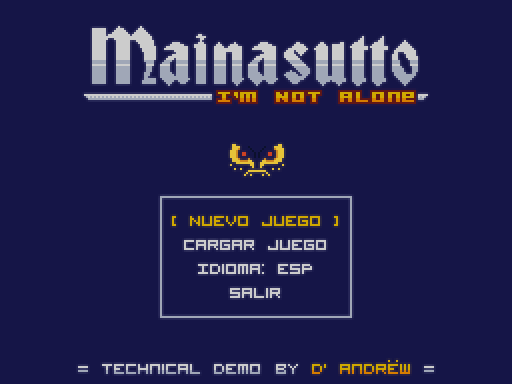 Mainasutto: I'm not Alone (originally named just I'm not Alone) is a metroidvania style videogame based on some Cave Story gameplay mixed with "choices matter" mechanics that the Squine Mode team with me started to develop on 2013, it started as a Cave Story hack room to the 'Gamers Place'(rip) and 'Kayin Pyoko' forums, but after a few problems in 2014 the project was cancelled. 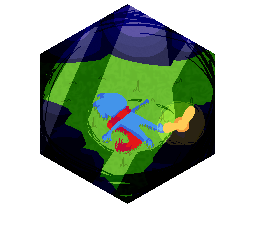 On July 2014 we resume the project with a friend to a Game Jam using Game Maker keeping with the original name but with poor and very minimalist graphics, and after that was cancelled again by the time that it costs to did just one stage. Next year, on May 2015 I resume the game by myself finishing the first public and playeable demo that was published on 'Newgrounds' as a flash game, it has only first half of the chapter 1 and with some bugs and glitches it received very good reviews despite all. That inspired the Squine Mode team again to resume the project on this new engine. 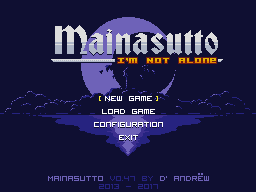 During 2015 the game was remaked again and again (almost 4 or 5 times more) by the team creating a new story and new characters, so after a lot of pression of them, I decided to work without the team, and that means changing the project name to 'Mainasutto' and adding the 'I'm not Alone' referencing my old creation. After the 7th~8th remake of the engine on 2016, I worked with a new composer and my friend (the same of the past years) who is responsible for making the artwork of the game and a bit of conceptual art, and in June 2016 a few days before the anniversary of the first demo, the new game was presented on the GameDev Planet 2016 having very good reviews and a few more people waiting for the next demo. Some months later, on the first days of October 2016 Squine Mode team was officially dissolved and giving me all intellectual property rights and the name of the game. So from that, with Erik 456c and Maldo we are working on the 9th and final remake, using now Game Maker: Studio and a new engine totally developed by me and used on Graveyard Garden to take their full potential and polishing details . Long time ago on another universe, the world was reign by a powerful entity called The Creator, a creature with a power granted by the gods to keep the peace during his life, before the life of the Creator of each generation ends, the gods carried out a tournament in which the strongest creatures of that world participate deciding the future of his world and who will be the new "Creator". But... Someday, the Creator rebelled against the gods to get the absolute control of that universe. And he achieve it. However, he didn't expect that the reincarnation of these gods would be born in order of defeating him. Years after having taken full control of this universe, these reincarnations would create a rebellion against the Creator, and finally beating him... Or so it seemed until the last moment, the Creator used his last energies to send these reincarnations to a distant future, but he failed. 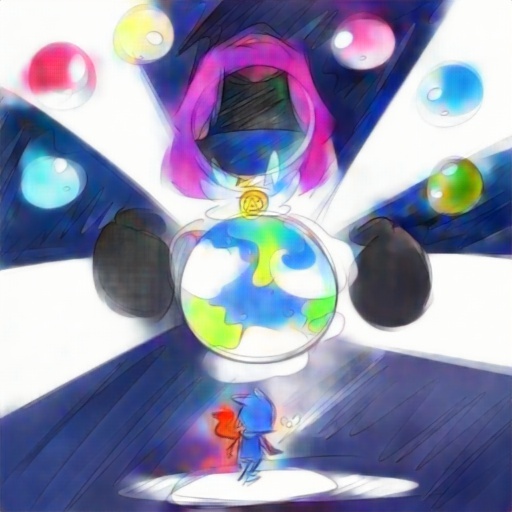 The timeline collapsed by the amount of power used, erasing everyone memories and keeping these in orbs scattered on the world, creating new ones on the people in a universe which is constantly restarting. Year 43 after the timeline collapsed, the latest reincarnation has finally arrived on the timeline. Now is your time to help this reincarnation to remind everyone and gather the other gods in order to beat the last Creator before he get the orbs and the artifacts to create a new timeline at his mercy. Thanks everybody who's following the project, and don't forget to apply for beta testers this week! After a day of the release of the demo (thanks for the +800 downloads <3), a few people contact me 'cause they have some issues trying to open the game, and there's the solution of the 2 biggest bugs of the game. Actually, people who plays in 4k resolution screens (why dude, is just a 256x192 game wtf?). Th solution isn't download something like the other one, but is a bit... tedious. Open the .exe propiety > compatibility > uncheck the screen scale if (...) of ppp. 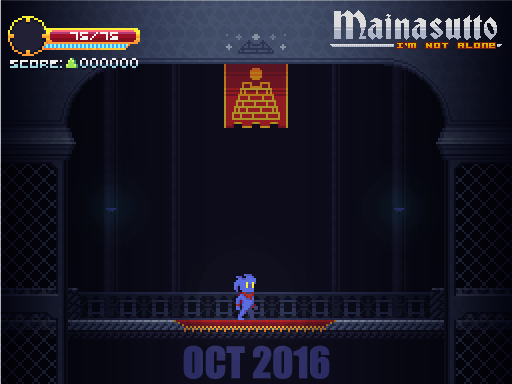 Finally, after months without any update I'll update the devlog, so this will be a VERY long post! TL;DR: SKIP TO THE END OF THE POST. After the demo I was over-busy with the university and a lot of things to do, but I'm here again. Last weeks I was working in the game, fixin' almost everything that you sent me, so, at this moment, there's no bugs from the Tech Demo. However, I'll write the changelog below with some images and features about the game. - [FIXED] Music still plays in the pause menu. - [FIXED] Player can backdash during the transition-door animation. - [FIXED] Player can enter doors while is reading a dialog. - [FIXED] Bug that makes you die by air outside of water. - Gamepad axis deadzone changed from 25% to 50%. - Gamepad and keyboard keys are now saved in different files. - Pause menu now keeps the last position after enters in a sub-menu. - Now player can't change the movement axis in the settings menu. - Now player can make combos and use skills with gamepad D-pad. - Dialog char. Speed is now slower. > Invensible duration from 0.33sec to 0.50sec. > Speed in "frozen" time from 5% to 1%. > Now player can't die by enemy damage while time is stoped. - Score now appears in the main pause menu screen. - Bar aside the inventory sub-menu. - Enemies drop system too! > Effect change from 'Can run' to 'Backdash STA cost -1'. > Now can be obtained in the Chapter 2. - New zone intro, not using sprite. - Player Half-run animation cycle. - [FIXED] Player can be trapped inside slopes. - New Player run-walk animation. - [FIXED] Overheal grabbing more hearts. 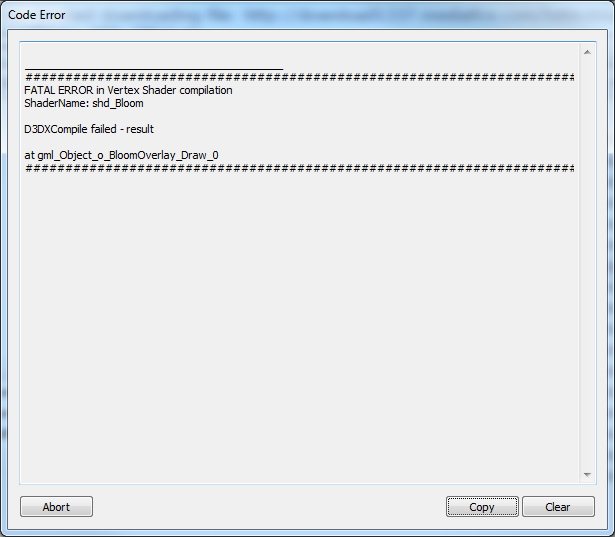 - Fixed loading fonts error when hit_receiver dissapears in the pause menu screen. - Breakeable Candles sprite & system. > Level up vfx upgraded. I actually bettered the infoboxes system, not much to say really. 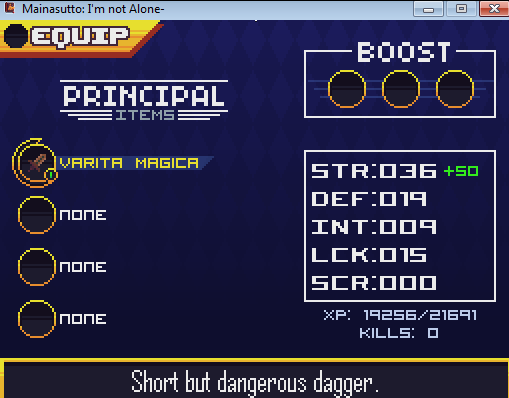 Changed the font of the info text to put more chars in it. That has a really nice vibe to it. The game is coming together nicely. Hey!, thank you a lot! I don't have a lot of time to work in this, but I do my best! Maybe it's not a update but..
Also, everyone who applied to beta testing, please check your email on May 1st. By the way, I trusted in you to let the ini files unencrypted to let you see the item and how the enemies and some systems work, even the dialog system... And you send me things like these. I have a lot of updates to share with you, but I'm busy af, so I'll leave here a comparative image of the first public demo of this game and the last screenshot that I take in the same spot, doing the same thing 2 years later. Hey I'm liking the updates so far, it's all coming together! Also just to check on the status of the soundtrack, are you in need of any more tracks? Nice idea, atmosphere, music, and Time Stop Jojo reference! I approve. And the backdash movement. I always loved the graphics and style of games like Metroid and Cave Story, but action games stress me out too much so I usually can't enjoy the atmosphere as much as I want to...so the less punishing the gameplay the better, for me. But anyway, I'm still looking forward to see how the world develops as it gets fleshed out more. Really thanks!, I'm kinda big fan of JJBA and Castlevania series. 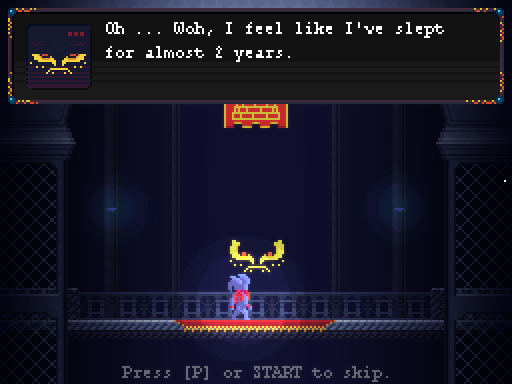 By the way, a few days ago I added a difficulty selection screen and a "casual" or easy mode, to people who want to feel like a hero and to appreciate the environment.